Eugene Melnyk angered hockey fans with his complaints about ticket sales on the weekend, but a Concordia University sports economist says the Sens owner's real target was governments with the cash to fund his team's new arena. Eugene Melnyk angered hockey fans with his complaints about ticket sales on the weekend, but a Concordia University sports economist says the Sens owner's real target was government, and his real goal is funding for a downtown arena. Moshe Lander dismissed the idea that Melnyk was speaking off the cuff, suggesting he planned his remarks and delivered them during a big hockey weekend in the capital to maximize their impact. "It's the perfect time to throw that little temper tantrum." Ultimately, Melnyk wants "a new arena paid for by some level of government," Lander said. On Friday, Melnyk denied rumours his team was for sale but suggested relocation could be an option. "If it doesn't look good here, it could look very, very nice somewhere else, but I'm not suggesting that right now," Melnyk said. He also expressed frustration over attendance, saying the team is "fighting every day to sell a ticket," and suggested that with most areas of the operation being run on a shoestring budget, the next cut could be player salaries. The promise of a new arena at LeBreton Flats is also tenuous, Melnyk hinted. "I'm all in, but it wouldn't be a disaster for us at all if LeBreton didn't happen," he said. 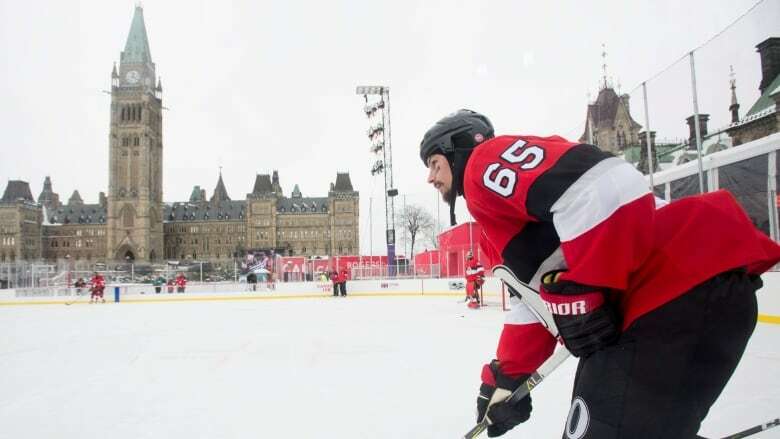 The Ottawa Senators-backed RendezVous Lebreton won the bid to redevelop LeBreton Flats with a proposal for an NHL arena as well as 4,000 units of housing and a French-language public school. The National Capital Commission is now negotiating with the group to sell up to 21 hectares of its LeBreton Flats property. Melnyk wouldn't be the first NHL owner in recent memory to put this kind of pressure on government to fund a new arena, and in the end it will probably work, Lander said. In Edmonton, the Oilers negotiated with city council for years until the owner spooked politicians with a visit to Seattle, which is hungry for an NHL team. Edmonton ultimately committed more than $300 million to the arena project, albeit with a plan to recoup some of it with increased property taxes. A new building for the Calgary Flames became fodder for Calgary's recent municipal election. "I'm a lifelong Flames fan, and it pains me to see the way the Flames are trying to hold Calgary city council hostage with threats of moving," Lander said. Such tactics can risk alienating fans, Lander said, especially if targeting those fans over attendance becomes part of the strategy, as appears to be the case with Melnyk.